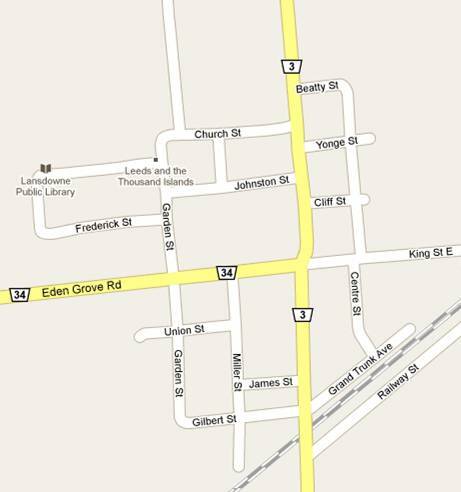 As early as 1808 stage coaches were traveling the ‘Front Road’, now County Road #2, between Kingston and Montreal. Stopping places were needed every few miles to provide fresh horses and food and lodging for travelers. Lansdowne grew up around such an inn, McKelveys Inn, at the corner of the present Reynold’s Road (south east corner, 901 County Road 2). Also here were a shoe maker Mr. Cutting, a store operated by the Darling family, and a blacksmith. The stone house at 896 County Road 2 was built by Alexander McNeil, an early settler. A log school, McKelvey’s School, was built in 1826. 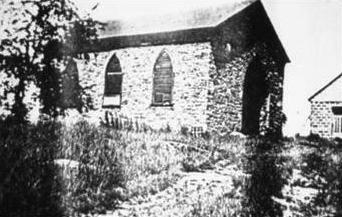 The Church of England (Anglican) built the stone Trinity Church in 1838 (north east corner, 843 King Street). The community prospered until the Grand Trunk Railway opened in 1856, one mile north. It then moved to the more important location around the railway station, and at first was known as Lansdowne Station. Some of the buildings were actually moved to the new location. In 1875 a new parish of Lansdowne was created. With the village of Lansdowne Station growing around the railway, it was felt a new, more central, church was needed. Land was purchased for $25 in 1877, and the cornerstone was laid in June 1878. The church cost $3000 to build. The stone used is local, and is cut in the ‘Bold Rock Front’ style, the only one of that style in the area. The Memorial Parish Hall was added in 1961. The Lansdowne Agriculture Society held their first fair in 1864. It was held along Grand Trunk Avenue, with cattle tied to the railway fence and exhibits in the drill shed on King Street. Horse races were held along King Street, with the judge seated in a tree near the present Presbyterian Church. The present land was bought in 1874. 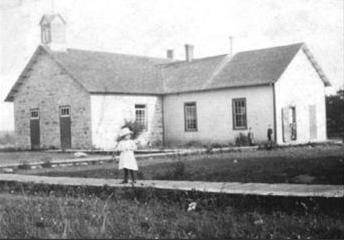 The first building was built in 1876, and is the building known to-day as Old MacDonald’s Farm. The red exhibit building was built soon after and enlarged in 1882. Dr. Elizabeth Rabb Beatty was born at Ballycanoe, Ont. in 1856. 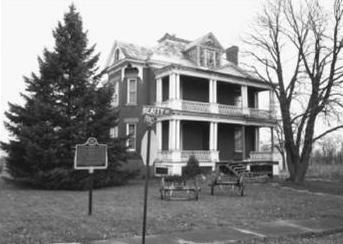 Her father, William, bought the property on the east side of Prince St. from the King corner to Tower Road in 1861. She received her education in Lansdowne and Gananoque. She entered Queen’s University, Kingston, on April 12, 1880, and was one of the first women to graduate in medicine in 1884. She offered her services to the Presbyterian Church and went to Indore, India, as one of the first women to serve as a medical missionary. Due to ill health she was forced to return to Canada in 1892. She and her sister built this house on part of her father’s farm some time after 1895. She died here in 1939. Rev. Wm. Smart arrived in this area in 1811 and traveled on horseback spreading the Presbyterian faith. Services were held in this area as early as 1860. 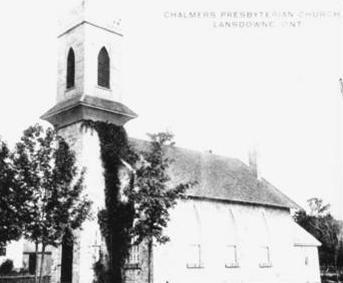 This building was built in 1872 as Chalmer’s Presbyterian Church on land donated by Wm. Beatty. It was the first church built in the village. 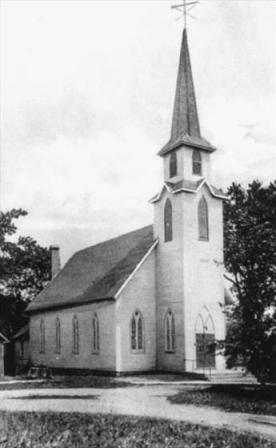 After church union, the building was sold to the Masonic Lodge in 1927. 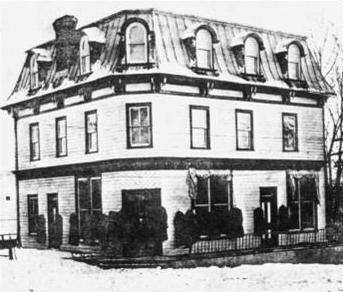 The building on the corner of Grand Trunk and Centre Street was Truesdell’s Hotel. Behind it was David McFadden’s livery stable. He advertised “good comfortable rigs and reliable horses, close to the railway station, open day and night”. The livery was destroyed by fire about 1913. Across Grand Trunk stood the Lansdowne Railway Station built by the Grand Trunk Railway in 1904. This replaced the original 1855 station which had stood on the south side of the tracks. 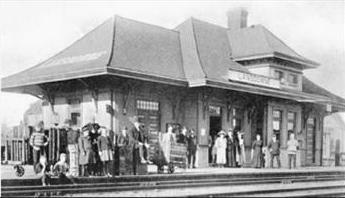 Lansdowne station was a busy place, with as many as 8 trains a day stopping. Large quantities of farm produce were shipped from here, especially cheese and cattle. The C.N.R. stopped using the station in 1966, and it was torn down soon after. This house is the last remaining building actually moved from the former location of Lansdowne. It was owned by the Darling Family, a prominent family involved in several commercial enterprises. 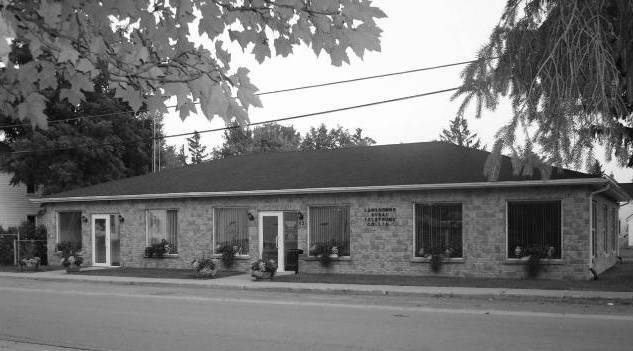 Their first location was along the St. Lawrence River east of Lansdowne where they operated a store and cordwood business. They later opened a store near the stage stop, and moved to the corner of Grand Trunk and Prince Street when this location of the village opened. J.D.W. Darling, who lived in this house, was involved in the forwarding business, sending local cheese, butter and grain to Montreal, and bringing in coal. He was also a justice of the peace and operated an insurance business in his office next door until the 1940’s. The original part of this building was built by Henry Mulvaugh in 1890. Mr. Mulvaugh was a conveyancer, an issuer of marriage licenses and a justice of peace, as well as a general merchant for over 50 years. The upper floor housed a dressmaker and a milliner employing as many as 13-15 apprentices. The business remained in the family until the late 1940’s. The outline of the original building can still be seen. The Lansdowne Rural Telephone Company was founded in 1906. 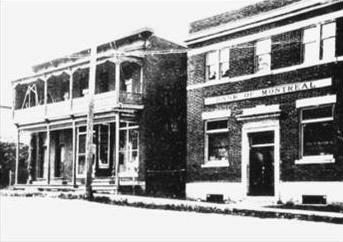 The first switchboard was installed in Fredenburg’s store, now Lansdowne Hardware. In 1912 they built an office and house for the manager on this corner lot. When the system was converted to dial service in 1967, it was necessary to build a new building to the east of the original. 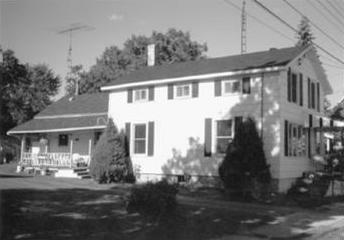 In 1988 when another addition was needed, the original office was demolished and new facilities were added. The company is one of less than 30 independents still operating. It offers all modern facilities including internet service. This stone building was built in 1890 as the Township Hall. It not only served for township meetings, but for entertainment, programmes and movies. The Oddfellows Lodge had their lodge rooms on the second floor. The fire department was formed in 1958. For some time they housed their equipment in a shed at the rear of the townhall. 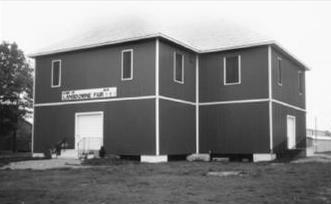 The building was converted to a fire hall in1963. This building, now the Victoria Apartments, was Lansdowne’s fourth school. 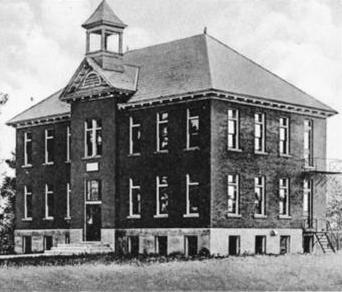 Built in 1912, elementary classes opened here in 1913. Middle school entrance exams were held here in 1914 and Continuation school classes for grades 9 and 10 opened that fall. 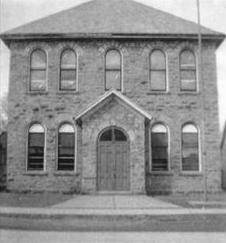 In 1921 a second room opened to accommodate grades 11 and 12. The cost of building the school was $7945. The Continuation School closed in 1956, and the elementary in 1962. Built originally as a hotel, this building has also served as a gentlemen’s clothing store, a bake shop, as well as the first home of the Lansdowne Telephone Company. Mr. E.E. Johnston opened a hardware store just to the north on Prince Street in the early 1900’s and expanded to this building in 1916. It continued to be operated by him and his family until 1985. Braehead School was built in 1872, the first school within the village. It was used until 1912. It is now a feed warehouse. This church was originally built in 1876 as Grove Wesleyan Methodist Church. At that time it was at the end of the street and surrounded by a grove of trees, thus the name Grove. 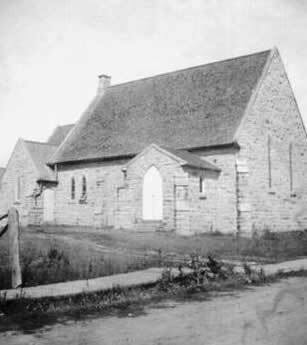 It became part of the United Church of Canada at church union in 1925.